WTT returns for its annual gathering to the Dartmoor Training Centre, near Yelverton in Devon on the weekend of 18 & 19 May 2019. 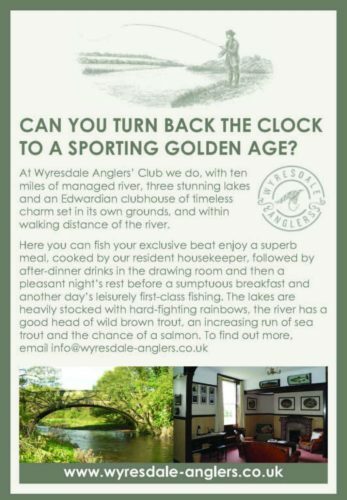 We are absolutely delighted that our Saturday of talks is headlined by WTT founder and genuine wild trout legend, Mike Weaver, reflecting on 70-odd years of trout fishing, including in his beloved westcountry rivers. Mike is supported by an excellent line-up, including Bruce Stockley and Bruno Vincent of Westcountry Rivers Trust (on some of their projects), Jamie Stevens of Exeter University (on amazing trout population research), Nicky Green (on crayfish), Chris Williams of the EA (on fish disease) and WTT’s own Mike Blackmore and Andy Thomas, on what they’ve been up to down south. In the afternoon, Ben Fitch, Bruno Vincent, Pete Tyjas, Snowbee & Paul Gaskell will look at aquatic bugs, tie flies and demonstrate angling techniques. The programme is HERE. Sunday 19 May will give our guests a chance to fish the Dartmoor rivers and streams and trial the Westcountry Rivers Trust’s FishApp digital booking system. The early birds will gather at the Training Centre from the Friday evening (17 May) to enjoy a bite to eat and a beer – please let us know if you can join us. We’ll do the same on the Saturday night – more information on that to follow. The Training Centre has youth hostel-style accommodation (dorm’s, bunks etc) where you could stay for £20 pppn and there are a number of hotels nearby; further details HERE. If you’d like to join us, please complete the booking form (HERE) and return to Christina in the WTT office.